Car fires are always a scary situation. They can obviously do a lot of damage and they can occur in a couple of different ways. Comprehensive coverage will cover fire damage to your vehicle regardless of what causes the fire, but it's important that you purchase the coverage for your car insurance policy before the loss occurs. Comprehensive coverage pays for damage to your vehicle that results from something other than a collision. It's typically optional by state law but your lender will probably require it if you've financed your vehicle and it's collateral for the loan. A deductible usually applies. If a fire causes $3,000 worth of damage to your car and you have a $500 deductible on your comprehensive coverage, your insurance company will pay $2,500 of the costs of repairs. You don't often hear about cars being intentionally set on fire, but it happens, and it would typically be considered a criminal act and at the very least vandalism. You must file a police report. Comprehensive coverage would cover your vehicle. A garage fire can cause a whole lot of damage not only to your home and its contents but to your vehicles as well. Your car insurance policy is your only option for compensation if your car is parked in your garage and it sustains damage from a fire. You must have comprehensive coverage. Home owner's policies never cover automobiles. Sometimes vehicle engines can catch on fire due to mechanical problems. Although car insurance policies typically don't cover mechanical failure, fire is an exception. Comprehensive coverage will cover the cost to repair your vehicle if your engine becomes engulfed in flames while you're driving on a highway, but you might well have a total loss on your hands instead—the vehicle can't be repaired and saved. Your car insurance policy will pay the actual cash value of your vehicle less your deductible. It usually takes a pretty severe accident to start a fire but, unfortunately, it does happen. It's probably a good idea to review the situation with your claims adjuster if you were in a collision and a fire started due to the incident. Whether the accident would fall under collision or comprehensive coverage will vary according to your exact circumstances and your insurance carrier. Even if you don't have collision coverage on your insurance policy, there's a good chance that you could still be covered if you have comprehensive coverage. Be sure to call the appropriate authorities as soon as possible if you find that you can't put your car fire out yourself or if you're not sure that you got it out entirely. 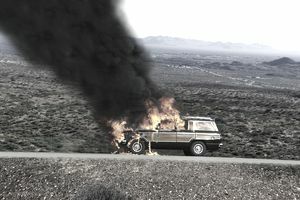 Car fires often cause the vehicle to be a total loss. Having comprehensive coverage can make a horrible situation a little more bearable because you'll know you won't have to cover the expenses all on your own. Review your policy because it's always better to know what your car insurance policy covers before a loss occurs so you're not surprised in a claim situation. If you don't have comprehensive coverage, it might be worth it to invest in it.